If you’ve been on the hunt for a place that combines delicious ice cream, friendly staff and an Instagram worthy aesthetic, Nice Cream is where you should be. Located at 44604 37th St. SW, a close walk from the Mount Royal campus, Nice Cream is a wonderful place to walk to with friends after class to grab a quick treat. 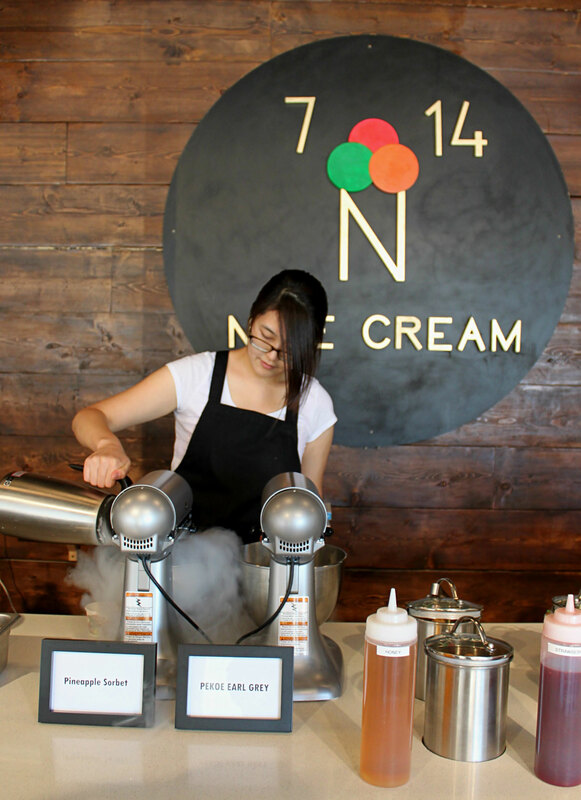 Nice Cream is brand new to Calgary and is not your typical ice cream parlour. When you walk in the front door, you won’t see a long freezer covered in glass. As fun as it was to point at the flavour that looked the best to you as a kid, we have stumbled across something significantly cooler. It was started by David Jung and four of his friends after a trip to San Francisco and a lot of taste testing different ice cream flavours. Jung, who previously worked as an engineer, resigned from his position and started up Nice Cream upon his return to the city. They used their zeal to create something special: they decided to use liquid nitrogen to quickly freeze their ice cream bases. By using -196 degrees Celsius liquid nitrogen, they are able to stop ice crystals from forming; making Nice Cream a creamier texture than regular ice cream. The ice cream is made with natural ingredients and they use real pineapple and coconut in their Pineapple Sorbet and Love Coconut. Each flavour has a story behind its name. Mt. Robson Vanilla was named after one of the mountains the owner use to camp at as a child, and Maas Chocolate was named after chocolate from the Netherlands. Perhaps the most adorable name is Love Coconut, named after the love one of the owner’s girlfriend has for coconut. Mt. Robson Vanilla and Maas Chocolate are classier versions of a staple to any ice cream shop. The stand out flavours are Pekoe Earl Grey (try it with a honey drizzle!) and Love Coconut. If the weather outside makes it too hot for your latte, you’ll want to try their Pumpkin Spice for your fall fix! David Jung’s favourite is Pumpkin Spice with honey drizzle and gingerbread pieces. Prices range from $3.99 for a small serving to $7.45 for a large serving. As if you needed another reason to go visit Nice Cream, all Mount Royal students get an additional 10% off their order when they present their student ID card! To take a look for yourself, visit them during their open hours from noon to 10P.M. or follow them on Instagram @thenicecream.